Growing in our garden are two of the commonest cultivars – Duranta erecta ‘Sweet Memories’ with stunning purple flowers with contrasting white centres and wavy white borders on petals’ edges, and Duranta erecta ‘Alba’ with sweet white flowers. Hmm…I wonder whether ‘Geisha Girl’ is a synonym for ‘Sweet Memories’ or is it a different cultivar with deep violet-blue flowers? Etymology: The genus Duranta is named after the fifteenth century Italian botanist, Castore Durantes, while the specific epithet erecta means ‘upright’ in Latin. 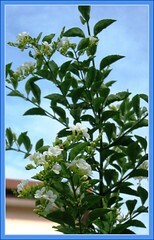 Features: This fast growing shrub can easily reach between 1.5-3 m (5-10 ft) tall and just as wide. It usually forms a sprawling shrub with drooping and trailing branches, or sometimes tree-like though rarely seen. Foliage is semi-deciduous with lush-green shiny ovate leaves that are sometimes toothed. Flowers are produced in clusters on the terminal growth of its graceful and weeping branches. These delicately fragranced flowers (individual flower measuring 12.7 mm / 0.5 in across) in colours of deep violet-blue or purple, sky blue or white, bloom almost all year round in spring, summer and autumn and throughout the year in the tropics. 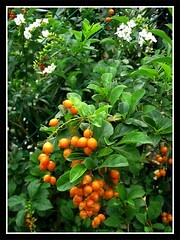 Duranta repens produces golden-orange berries in hanging bunches too. A very showy shrub with flowers and berries on the plant at the same time! 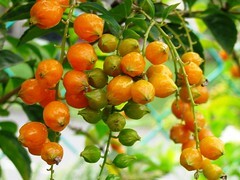 Its pretty flowers attract bees and butterflies and its bright golden berries are relished by birds. Some regions, such as Australia, China, South Africa and several Pacific Islands, have considered this showy shrub as an invasive species. Warning: Be aware that these attractive Duranta repens’s berries and leaves are toxic and have been found fatal to humans, animals and possibly pet birds. Read about its poisoning to 9 dogs and a cat. Culture (Care): Duranta erecta or Golden Dewdrop is such an easy-to-grow plant and needs little maintenance. Light: Prefers full sun, though tolerates semi-shade. Moisture: Needing moderate water, regularly. Soil: Grow best in moist, but well drained and moderately fertile soil in container or ground. Others: With a sprawling growth habit, Duranta erecta ‘Sweet Memories’ will definitely require regular thinning and pruning to keep it under control and encourage bushiness so that with more new growth (branches), you’ll get more flowers. Generally, it’s free of serious pests and diseases. For subtropical and temperate regions: Hardiness: USDA Zone 8a-11. Read here for more plant facts. It is sensitive to frost and extremely cold winters that can kill the shrub to the ground. However, it may recover and ‘return to live’ when warmer weather approaches in spring. Propagation: Propagate from seeds or from semi-hard stem cuttings. Duranta erecta ‘Alba’ which is also grown in a container in our garden, is just as lovely with pure white flowers. It is a more erect bush, seemingly the hardiest of Sky flowers and can shoot skywards unhindered very easily. Like the ‘Sweet Memories’, it flowers abundantly and produces golden berries too, though not as much as the former. I’ve just got acquainted with names and description of other duranta cultivars, not knowing that there were those with lovely variegated foliage too. How immense and magnificent is God’s creation of beauty and nature! 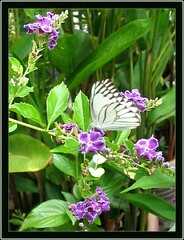 Here’s sharing images of a butterfly and a bee nectaring on the Pigeon Berry’s flowers! as shown in the left photo. captured a few months ago. WoW! Thank you for the info and pictures of sweet memory Duranta… I just bought a 3 ft one today.. It was so pretty and I liked that it was fast growing as I have a short grow season due to snow in winter, and I have vast areas to fill up! all the info helped plus you pics were awesome! It’s the end of summer in my Zone 9, and I’ve just been introduced to “Sweet Memories” Duranta. There’s a full sun plot in my yard I hope to fill with this beautiful plant… and soon. Is it the right time for planting? I love my Duranta shrub so vivid in color. 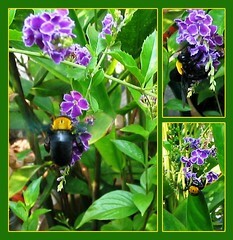 I’am not able to prune the shrub this season yet due to huge black aggressive bees chasing me away . Does anyone have a suggestion on what I should do. I have a mixture of bumble bees and a black bee that resembles a bumble bee? Hi Lisa! You may want to prune your shrub in the late evening when the sun has set and the bees are no longer around, having returned to their hive and are most dormant at this cool time of the day. However, if the hive is on the shrub itself, then it’s a different threat altogether. In my opinion, it’ll be faster if you do a google search on how to rid of bees where lots of options are available to suit your own situation. All the best in your solution. I have a wonderful duranta in my courtyard and it has bloomed twice since June. However, it has had buds on it for about three weeks with no blooms and some almost seem like they tried to bloom but died before the flower actually developed. Any suggestions? Hi Jenny! And thanks for visiting! Thanks! It has also produced a lot of new foilage in the last month. I can tell the that the buds are trying to bloom and just kind of dying before they actually become a flower. I will try to trim it back and see what happens. Any suggestions on trimming techniques for this particular plant. Hi so how do you grow your own? I have 3 or 4 that are great and want to plant more. I can’t buy them at the moment, I have seen a standard $22.0 and potted cutting $10.99. How do i make the cuttings and plant them so they i can grow my own? Hi Peter! From your matured flowering plant, just choose any semi-hard stem (preferably an older stem that already bore golden berries at their terminal), prune it off the main plant and cut into 5-8″ lengths. Then remove from each stem cutting all the lower end leaves with a sharp scissor leaving some top leaves behind. Prepare your potting mix, plant your cuttings and water it. With daily watering and located in semi-shade area, given time they should sprout new growth and take root. I would suggest that the best time to propagate is when you’re ready to prune your bush and thus have ample stems to choose from, and more than enough cuttings to grow, with more chances of success! Wish you all the best! its leaves are turning yellow and dropping off…..ive tried more water, ive tried less water…..does it need a bigger pot…..how can i save it? Our Durata is in the ground as a schrub. It is January 08 and we have had about 4 or 5 freezes into the lower 20’s. We have not pruned this plant at all, but need to know how to prune if not too late. We usually trim our Lantana back to the main stems. Can we do the same with Duranta? Pruning advice appreciated? Hi Jon! Durantas are such tough plants that no matter how hard you prune them, they come bouncing back! A few months ago, I’ve even cut back our 5 ft. potted bush right down to a single main stem of less than a foot tall and it survived without any vengeance! Pruning is really subjective, you can prune after flowering or after fruiting or even before flowering if you want a more compact bush. And, the cut stems can be used to propagate new babies, isn’t that lovely. Kindly refer to my earlier responses dated Sept 24 and Oct 7 above, regarding pruning and propagating. However, being a tropical gardener, I’m unable to confirm whether winter is the right time for you to prune your bush. Since you’re unable to overwinter your bush inside, you may probably want to try cutting at least one semi-hard stem to propagate inside your green house, to ensure continuity. ;-) This forum discussion may interest you. All the best! Well, I think the basic needs of your darling Duranta is a VERY good draining system, (ESPECIALLY IF she lives in pot), and a good antifrost protection, by a special clothing ( for plant protection), during her hibernating months. During her growing period she needs a lot of water spraying, and a little more watering, WITHOUT waterlogging!!! During her hibernation she needs almost no watering — when living in pot, too. I hope, I helped a little!! Good luck!!! 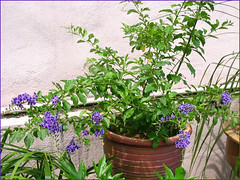 I am looking at planting some Duranta’s with the idea that they will form a hedge. The weather is starting to cool off here however it is still high 20’s and low 30*c. In summer the weather is often high 30*c to low 40*c. The place that I have to plant them will get full midday and afternoon sun and is near the house. Will this be too hot? Will the plants get burnt from the heat/ reflection from the house? hello, I just ought mine from Walmart, It is about 4ft tall looks more like a little tree than a plant and I’m wondering if I can buy a big pot to continue growing it in or do I have to plant it into the ground. I want it to get about 8ft tall and 8ft wide to cover near my pond. Should i put in ground or can i use a big pot, if pot any recommendations on size. Durantas can thrive very well in ground or containers, but of course, growing in ground is always a better choice. Thus, if you have ground space and not bothered by very cold winters, go for it. Just to give you an idea should you decide to plant in a pot, our plants are in pot size less than 15 inches across and we’ve allowed them to scale as high as 7-8 ft without trimming. Probably a larger pot than this is better, I think. I ttok the chance and planted it in ground… I’min zone 8 (Augusta, GA) and I believe our frost is over…it’s also in direct sun. I purchased it from wal-mart (Golden Dewdrop) Duranta repens… So far this week has been getting up to mid 80’s. I water in early morn and in evening. I’m hoping i don’t over water it. Is that possible? Also, I’ll rad over the posted messages, but need to know if I have to pruns the tree, if so when? I don’t know much about pruning so will read up on it if i need to. I would like for this plant to get up to 8ft high and 6ft wide…is why i ask about pruning. I’ve been reading that the fruits are poisonous to humas but not to the birds that eat them. My understanding the fruit contains a certain type of acid. Do you know how much needs to be ingested and how long it takes for it to be fatal? I have a dog and I’m hoping he doesn;t try to eat them when they fall and get poisoned. thanks for all the help and info!!! These are just my humble opinion: as long as your ground soil is well-drained, over-watering will not be an issue. And, pruning can be postponed for the time-being since it’s better not to over stress the newly planted tree as it begins to get established and adapted to the new ground first. Later, you can prune its long arching branches either after flowering or fruiting. I’ve read too that the berries are very poisonous and fatal to humans and animals. Better to keep you pet safe from it than to risk it being subjected to the toxicity, no matter how small the amount, I think. Sorry, I don’t have answers to your question, though I did try to surf the net but of no avail! Hi Sennur – thanks for dropping by! It’s been a few weeks since i’ve planted my tree. I’ve noticed some leaves turning yellow. I’ve watered it everyday, in the morning. i have mulch on top to help with holding water. Think i’m over watering? I am really enjoying your site. 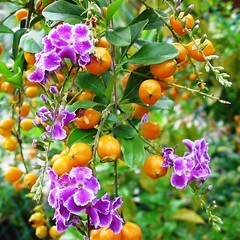 I have a beautiful duranta which I love, but just discovered today from reading that the berries are poisonous. I have two dogs that I do not want to lose, but I love the plant. Could you advise of a similar plant that is less toxic? Hi Carol! So glad to receive your positive comment. Hi, I am very glad to read some news about the duranta repens. I live in Tenerife. Could somebody tell me where can I find the seeds. Would they be in the orange fruits ??? Got some friends from mainland Spain and they felt in love with ine but cannot buy one over there and she would like to experience with seeds. thanks in advance for your answer. I have 2 Durantas that are wonderful~and as a permitted rehabber of Hummingbirds I love watching them make a “bee”line for those bushes upon release. But I found you site while searching for toxicity in plants to songbirds. I also am adding a few Lantana Confetti and now find that the “berries’ are toxic. My search is to discover if they are toxic to wild songbirds like mockingbirds, sparrows etc. Any help appreciated as the goal in my garden IS birds. Sorry, I’m unable to help, deb! What about growing small edible fruit trees instead, those whose fruits are relished by birds too? Just a thought, though I’ve no idea what local fruit trees are available at your area. Hi, im wondring if the plant (smkf) can be planted in the shade. I think is an attractive addition to an arbor, however its proposed to be planted in a shady or mid day only sun spot?? they are responsible for seed dispersal.” I live in Southern California and just bought one at Lowe’s. The hummingbirds and butterflys love it! It is staked up in the pot so I assumed it would grow like a vine. but now that I read more about it, I think I will train it more like a tree. It is right outside of a beveled glass window in my entryway. It looks so beautiful there – it’s not even funny! I’m glad to know it’s in a good spot with only part sun/part shade. It was wilting quite easily in just the few hours of sun it got right after I brought it home. Sounds like it was just in shock. Thanks for for all of your encouraging info! I pruned my Duranta about a month after I planted it so that it would get thicker. Since I did that it has grown to about 3 feet tall but is still not flowering. Should I have not pruned it until it blumed? have 2 new duratas in the ground last week and the leaves are green and droopy. Planted next to house with east exposure in a warm climate. Will the leaves perk up or are they going to fall off? I watered them well when I put them in ,then cut back and now watering again. Any help? Just my 2 cents worth…usually, new plants can be stressed, showing such symptoms as you’ve mentioned as they acclimatized with the replanting and the new site/conditions. Leaves will definitely fall, it is natural. Keep soil evenly moist but do not overwater, and water only during the evenings when the sun is no longer shining on them. That is all I would normally do and monitor for new growth to know they are okay eventually. 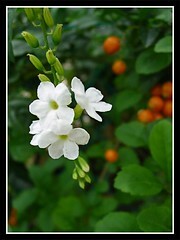 Hi, I have a large and spreading duranta healthy plant. Problem is that after I pruned it back last fall or early spring, I get no flowers on it. However the cuttings bloom well just stuck in pots. How can I prune the now too large again plant and still get blooms. Also, I have never had any berries, even the first year when I was afraid to cut or prune it. It gets way too big and tries to come in the door. I keep telling family I can’t cut it or I won’t get blooms. I would like to know if it can be propagated by seeds, if the seeds are inside the berries, howI know that a berry (seed) is ripe and how difficult it is to cultivate it from seeds. It can be propagated by seeds though I have never tried it out as the other alternative method by stem cuttings is simple and quick. The seeds are inside the ripened golden berries that will dry up and turn black. To propagate, I’m unsure whether one need to plant the fresh golden berries or the shriveled black ones. I’ve meant to experiment this method but so far have procrastinated. Maybe one of these days….! I have two beautiful durantas that are about 6-7 feet tall right now and I want to prune them. We get a lot of hummingbird action on the flowers but have not seen any songbirds on the berries. To prune a spent flower branch do I cut it back right the the point it meets a main stem or a few inches from that stem? also for letting me know it’s that easy to propagate, which I will now do with the cuttings! Thanks! I feel much more confident now. I have had a Duranta erecta for 4 years and love its hardiness, but I really would like to move it. Would transplanting it harm it? I wouldn’t want to risk killing it. Saw your article on Duranta’s. I have 3 planted in my front yard. They seem to have had a rough time this winter. One look like the wind had blown all the leaves off it. I don’t think the deer got it because they had left the other two alone. Anyhow, is now the best time to prune them back and how much do I prune them. They are about 3-4 ft high. 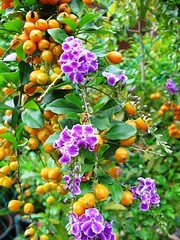 Sorry, I’m unable to confirm whether now is the best time to prune your duranta as I live in tropical Malaysia without the 4 seasons. Hope some temperate gardeners to this site can answer your enquiry. Regarding how much to prune, well…prune anyhow according to your preference as durantas are very hardy plants and can tolerate hard pruning. Please refer to my earlier answers dated Jan 11 2009 and Jan 9 2008 above for further insights. Jacque-I’m in zone 9 in Texas where it can get brutally hot in the summer (100 – 110 degrees not unusual) and my duranta does fine with good irrigation. It’s in the ground; gets a little shade from towering pecan about 20 feet away. My question is can I NOT prune at all. I want a tall, full shrub. I read it can reach 10 feet – would love that! But I want shrub form, not tree. Can I just leave it alone? Must I prune to get flowers? tks. I think you do have to prune to get a shrubby form. Otherwise, it will just throw out sprawling branches that are too long, looking disorderly and straggly, as well as too weak to support the berries that form at terminals. Pruning produces more branches, and that naturally lead to more flowers which will emerge at the end of the branches. That said, I do find it difficult to train my potted durantas into a shrub or a tree. So I just give them a hard prune once in a while to control its size as they are potted. Growing durantas on the ground is definitely a better option for optimum growth. Well looks like my durantas isnt coming back. It must have died over the winter. I planted it last summer and it bloomed fine but now its just a dead looking tree with no leaves and all brown branches? Is there anything i can do to revive it? Hi Perry! Sorry to read about the condition of your durantas. Are you really sure that it is dying and not just winter-stressed? I know nothing about temperate gardening but having read Chris’ comment above (dated March 14, 2008) that his plant came back from the base after a frost attack, I’d like to think that yours can survive too. If I’m in your shoes, I’ll follow my gardening instinct and give it a hard prune by removing all the deadened branches and cut back right down to a foot or two from the ground. If it appears healthy at the cut surfaces, then there’s a big chance it will survive with proper aftercare. Just my two-cents! All the best to you, Perry. ok i just noticed some plants growing from the ground near the base of the trunk. As if its coming back as a bush. Not sure if its it or not. I’m looking at the leaves and am not sure if its the same leaves but they are pointy on the ends. Been lookign at pixs of durantes ot see if its coming back as a bush.Could that be it growing ? i cut it til there is about 8 inches of the trunk left cause all was dead. is there a pix of them when they are first growing from the ground so i can see if its it. Orcan i send mine for viewing.. don’t want ot be growing a weed thinking its a durantas coming back. Post an image here by all means, Perry! sorry for the delay not sur ehow to post a pix in the message board but i took 2 pixs of it.. Thanks for providing the links to your lovely images. That’s definitely your duranta coming back strong and in good condition! Congrats, I’m delighted for you. Yay!!! thank you very much!!! Do you think i should cut that center branch off or cut it down to the top of soil, if nothing grows from it? or just leave good enough alone? Any of the options you mentioned is okay, Perrry! My choice will be to leave it as it is because a dried stump will fall itself eventually. I have three durantas that were planted in the spring a year ago. The leaves look beautiful, but they have not bloomed. One is in part shade, the other two full sun. Why haven’t they bloomed? I have just identifies my duranta after having bought it at WalMart two years ago. It had no naming label, rather just identified as a “tropical plant.” It has bloomed beautifully both summers. Of course, I have had to bring it indoors in the winter since I live on the border of z6 and z7. I enjoyed reading all the comments and questions, but the main reason I wanted to write was to thank you for not being timid about your belief in God. He is indeed great, mighty, loving, and ever so creative! Blessings. Thanks for sharing your thoughts, Stephania B. About God, that’s the least I can do, to offer praises and thanksgiving in gratitude for all His wondrous blessings, love and mercy. Really appreciate your affirmation about Him. From what I have read on the web and some of the earlier posts, it seems my problem is not unique. I pruned my durata as the stems were too long and droopy and I wanted a bushy plant. Since then, it has not bloomed once (it has been 5 long months!!). It has however grown wildly in all directions and I have to keep cutting it down so that it doesnt grow into my other plants. The leaves look different when they grow out (they are lighter green, softer and have a more jagged edge). It almost looks like a different plant than when I bought it! I have tried regular fertilizing, then tried ignoring it, tried more watering and less watering…and I now read that I may have to acidify my soil!! And my plant cuttings have all died! Since we’re both from the same tropical part of the world, I wonder whether you have any advice to give me? Have I overpruned it? Your experience with duratas seem so different from mine! I’m as confounded! What I can say is the clusters of flowers appear at terminal stems, and if you keep pruning their typically long stems before blooming, then of course they’re unable to reward you. ‘Sweet Memories’ have unusually long stems that can reach 3-4 ft long whereas the lavender-blue ones have shorter branches, more compact and easier to train into a bushy shrub. Until today, we’ve been unsuccessful in getting our ‘Sweet Memories’ into a shrubby plant as desired. So, we just give it a hard prune once in a while instead. And, eventually after a flush of new growth with lots of sunshine+water, it will flower prolifically and set berries as easily. How long that takes after a hard prune, I really don’t know as I didn’t keep track of time. Thanks, Jac, I really appreciate your time taken to respond to all the queries in your website! I guess I should have given it more space to grow. But I would never have guessed how big it has become in such a short space of time! Thank you for such a beautiful blog! I’ve been admiring my neighbor’s Duranta (without knowing the name until today) since before it started hanging more in my yard than hers! I love this plant. Good to know that it is easily propagated. I will share with someone I know. Our pleasure, Jeannie, and glad to have been of help! We appreciate your generous comment and thanks. Thanks again Jacq – your description for the Duranta Erecta is great and I swear I will get some of these for my new garden. You’re most welcome, Sim! Aren’t you blessed….sunbirds are lovely visitors to be enjoyed too, we rarely see them in our garden! I appreciate all the information I have read. We bought a new house in May 09 and this wonderful plant was one of the plants that the builder put in our bed. I did not know the name let alone of the information I have discovered on your website. I am very please to know that we can continue this plant in other places in our yard and I am also so happy to hear that I can pass it along to loved ones and friends. I do have a question about this plant that I was unable to find an answer to. Where the builder put it at the time that he bought it fit well. Now that it is over 5 feet tall it does not go well. We did prune and unfortunitly I did not know we could replant it. What I am wanting to know is now that we are at the beginning of winter and thinking into spring, can we move this plant without killing it? I moved an Esperanza but it went into shock and lost all of its leaves and flowers but the branches are still green. I do not want to loose this plant also. Thank you for anything you can give me. Have a blessed week!!! Hope temperate visitors reading your enquiry will be able to assist you, as we’re in the tropics. My wife and I have just moved in to a rent house and there is a Duranta in the backyard that is extremely healthy. Unfortunately, it has not been trimmed for months and is very wild. What is the proper way to get the Duranta under control? What shape should it be pruned into? We are afraid of harming it if we prune it too much. We also suspect that birds have nested in it and certainly do not want to disturb them. From Northern Alabama in Zone 7b: My duranta repens is in a container in 6-7 hours of sun. The flower stems are “leggy” with flowers on the ends (6-10 inch long stems with flowers on the last one inch or so) and is becoming unattractive. Should the flower stems be cut back? Or should I prune the entire bush?? Hi Stacey! Pruning either way, be it the stems or the entire bush is really your choice and it takes well to hard pruning. Since flowers appear at terminal stems, recommended to prune regularly to encourage bushiness and more branching, resulting in more blooms. We have a beautiful Duranta that bloomed great the first 2 years but has not bloomed the last two years. It has lots of healthy green foliage but no flowers. We pruned the plant back in the early winter and then let it grow because we thought we might be taking off the buds by pruning too close to blooming time but it has not helped. What might the problem be? Not sure, Kristine! Have you tried feeding it with a flowering fertilizer with a higher % in potassium? Check @ http://www.gardening-advisor.com/Flower-Fertilizers.html for extra details. Hi there, back in May, which is a prior to winter in New Zealand, I bought a 6ft tall potted Duranta “Alba” with two bushy flowering branches. Within a week it started dropping leaves, so I thought the tree is stressed due to re-potting to a bigger pot. It turned out the lovely new tree was affected by scale. After 3 months of hard spraying and fighting with the disease, it still looks so poor, it has dropped almost all its leaves. It is still in a green house, well protected from winter cold and rainy weather and overnight frosts. But it is still alive with new tiny 3/4″ green stems starting to show up. Please advise what else I should do to help it to recover. I really do not want to lose it. I recently purchased a duranta on sale and will never regret it. It is on my patio (Western exposure) and has been in full bloom since I bought it. In Texas heat it drinks quite a bit of water. A friend has one in the ground (Eastern exposure). She says the best time to prune is late winter or early spring. Then she throws timed release fertilizer on it. This plant must have some direct sun in order to bloom. Do NOT allow to dry out. Place in a protected area in winter if in a container or, pull inside and place in a south window. Well worth the effort! I have a midnight blue duranta that is in bloom right now in the Houston, Texas area. When should I prune it? i have a duranta that we need to keep in doors for the winters. (MN) i keep it in the west window and have notice that it has some kind of sticky stubstance on the leaves and stems with what look like bug pods. it leaves a film all over the window sill and what ever the branches touch. i water and fertilize every three days. how to i get the bugs off? Hi Lisa.. I don’t know about bugs sprays safe for this plant, but you could ask a plant place. I have found rose food with other pest control etc. works on many other plants very well. My problem with this duranta is I moved to a home where the plants hadn’t been watered in months. Looked pretty dead. I live in So. CA where temps reach over 100 degrees… I cut the plants way back, two appear to have a few leaves growing. Do you think this plant is hardy enough to grow back after no water for months with really high temps? I am hoping so. Finally I found out what the beautiful plant is that I bought in the garden centre! Thanks for the compliment, Lianne! I think your plant has been overstressed …being uprooted, disentangled from the root mass, replanted and so forth. Hence, you just have to wait and see, and hope that it gets well-established and acclimatized with its present situation. Wish you all the best and hope you’re able to get more insights from the other posts as mentioned. You’re most welcome, Pam…glad to be of help! Thanks for sharing your experience so that others with such very hot summers would know how to care for their durantas. I just bought a little Duranta tree this morning. I live in Canada so it will be an indoor plant. I was wondering, when should I re-pot it? I have a Durantain bush in a pot on my balcony in SoCal along with the tree version. The tree is doing great and attracts lots of hummingbirds. But the bush drops lots of blossoms, tiny black circular things/seeds and what look like seeds/dead blossoms. Very messy and the blossoms are almost gone. Lots of green things that look like future berries. There was some new growth but no new blossoms. Blossom drop en mass whenever I water but when I don’t water it looks dry and thirsty. Any advice? Was given a Duranta Picotee blue for Mother’s Day, and I adored it. Unfortunately it suffered a FOOT plant and was broken at the ground level. Will it regrow from root? If not do you know where can I purchase in Louisville Kentucky? We received a small durante erectus as a gift at my daughters wake, my daughters favorite color was purple and this plant is beautiful with delicate purple flowers. My problem is that we live in northwest Indiana. We transplanted it in a larger pot a couple mos. ago and did well, but the weather has gotten cooler so we brought it inside. We put it in front of a southern exposure window. The soill drains well, but all the leaves are dropping off of it. This beautiful tree has sentimental value to us so we want it to survive. Should I prune it back? Any suggestions would help. Thanks. “sparrows feasting ravenously on them” don’t die? I just planted one of these and am concerned with my dog & granddaughter getting it. I have 2 Durantas and I love them….so beautiful and they grow like weeds! My question is about the offshoots, or pups, that sprout all around the plants. I pulled up 3 of them, thinking they would look nice in another part of my yard. I shook off the dirt from the roots and transplanted them. I watered them every other day (I live in Houston, so they need the water) and they died. I would really like to have a Duranta in this spot…what am I doing wrong? Thank you for any help. Bought my Skyflower (Durantas) in June 2007…planted it in a spot on a hill but it did not like where I had placed it and the deer loved it. So I replanted it to a different spot in 2009, again the deer loved it… I was determined to get it to rebloom…Put up deer fencing and showed it lots of love and it has finally come back. It is so beautiful this year. Did not start blooming until end of July but the purple/white blooms are beautiful. I want to share this plant with others, what’s the best way to propagate; cuttings with root boosters or should I save seeds from the berries? Both ways of propagating these beauties as you mentioned are indeed viable. However, I’d prefer to propagate them from stem cuttings which grow faster than from seeds. All the best to you in your endeavour. Hi. I have a small duranta planted in my front lawn in full sun. We live in Adelaide, Australia (hot, dry summer, cold winter) and are well into spring. I gave the plant a hard pruning in winter and now it has lovely green leaves – but yesterday I noticed the newer leaves at the top are all curling! Now signs of mites or fungus, just curling – still green, not brown. Have you any experience of this with your plants, or any idea what it could be and how to treat it? I have cut off the leaves but don’t want to lose the tree. Hi Deirdre! My 2-cents opinion is you have to treat your plant with an organic pesticide to get rid of the pests feeding on the leaves and prune off those smaller branches whose leaves are infected. Loved reading all about the Geisha Girl – Duranta . i purchased 12 plants approx 1m (3ft) high. Do you think planting along a fence line 1m apart is a good distance. i would like to grow it along the fence. My husband doesnt agree with planting too close to the water tanks as the base of the tanks is a plastic. Any suggestions would be greatly appreciated. 1m apart should be fine, but if you prefer a dense hedge then you may want to reduce the distance apart slightly. You’d need to google search to know whether duranta’s root system is extensive and would pose any potential damage as ascribed by your spouse. Sorry, I’m unable to assist here. I was looking for some information on my newly acquired “Sweet Memory” Duranta and came across your website; I love it and want to say thank you. I feel as if I just met my plant (through you) and now I know it’s life story. I’m hoping to have a long and healthy relationship with it – thank you for the introduction! You’re most welcome… my pleasure in sharing, Esperanza! Thank you for your kind comments and wish you all the very best with this beauty… may it give you much cheer and joy! Happy gardening and have a great weekend. I have a Duranta plant. I recently recently repotted it in a ceramic pot. It is on my east porch. It was doing great but some how the stem of the plant got broken below the tree top. There are sprouts at the base of the plant. I didn’t know if it can be saved?? Can it be planted in the ground?? I live in Western Kansas . I didn’t know if it could survive our winters??? 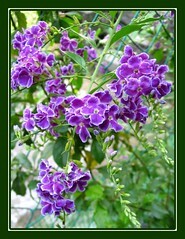 I’ve just bought a Duranta “Sweet Memories” to plant as a small tree. It’s already got a good upright, with branches about 4 ft above the ground. How do I prune it to keep it to about 8 feet tall and 8 feet across? And how often should I fertilize? Thanks for helping. Hi: We are getting ready to paint the exterior of our house. I have a dilemma with my sweet memory duranta tree. Should I have it pruned back totally now in anticipation of the painting project, so that the painter can reach the area behind the tree to paint OR should I just have the tree trimmed on it’s backside so that he can reach the fascia and stucco areas. It’s almost July now and I haven’t had to pruned for about a year and a half. Thanks, Marlene– and the tree has blooms, I forgot to say!!! 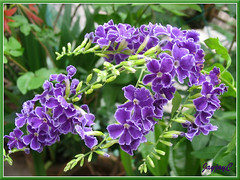 Regarding the Duranta “Sweet Memories” grown as a standard in a pot, can anyone tell me how large I can expect it to get? Currently the trunk is 38″ high and the head is 20″ high with a 30″ spread. 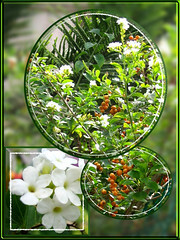 We have 3 Duranta trees in pots , what is the care for them , they have flowers and berries. what fertilization and care instructions do you have for us?